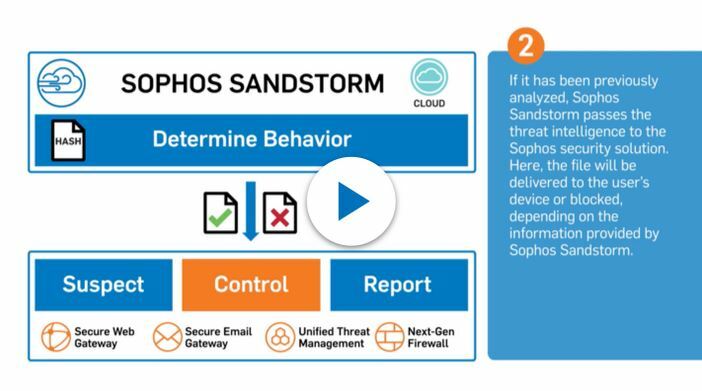 Sophos has announced that its Sophos Email Appliance now includes Sophos Sandstorm, an advanced, next-generation sandboxing technology that quickly and accurately detects, blocks and responds to sophisticated, constantly-changing cyber threats. Sophos Sandstorm is an advanced persistent threat (APT) and zero day malware security technology. To combat elusive threats that target email accounts on multiple platforms and mobile devices, companies need signature less protection in addition to traditional malware protection. Threats are now engineered to be “low and slow” to stay under the radar, using polymorphic and stealth techniques to avoid and delay detection. Today’s cybercriminals are also proactively taking steps to target, research and crack an organization’s specific security measures by sending bespoke malware attached to seemingly-benign email messages. Sophos Sandstorm uses powerful cloud-based technology to isolate and address these types of threats before they enter a business network. Information technology managers are provided with detailed reports of threat behavior and analysis for further investigation and action, if required. “Sophos Sandstorm combines prevention, detection and investigation in one solution to protect against cybercriminals who now use social-engineering tactics with new, not-previously-known malware to invade company networks,” said Bryan Barney, senior vice president and general manager, Sophos Network Security Group. Sophos Sandstorm determines potential threat behavior across multiple operating systems, including: Windows, Mac and Android; physical and virtual hosts; networks; web mail; Word and PDF documents; more than 20 file types; mobile applications and more. Sophos Sandstorm is available as a subscription option in Sophos Email Appliance 4.0. Sophos Sandstorm is also available as an option for the Sophos Web Appliance, an advanced web protection solution that scans web content and blocks the latest web threats. Customers will also have the option of adding Sophos Sandstorm to Sophos UTM 9.4, a comprehensive firewall solution, which is currently in beta.